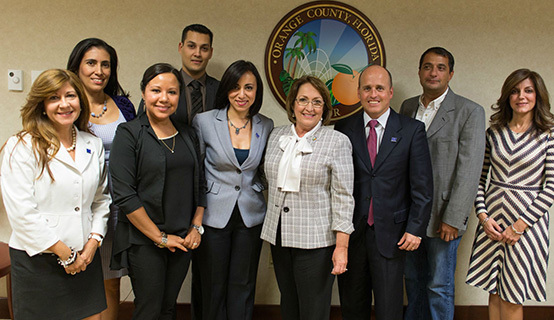 Orange County Mayor Teresa Jacobs met recently with the Hispanic Business Initiative Fund’s (HBIF) board of directors to discuss accomplishments and opportunities to support the region’s Hispanic small business community. HBIF has helped thousands of Hispanic entrepreneurs since its inception and will celebrate its 25th anniversary next year. HBIF is headquartered at the state-of-the-art National Entrepreneur Center, which is located at the Orlando Fashion Square Mall. HBIF President and CEO Augusto Sanabria and Vice President Gaby Ortigoni attended the meeting and were accompanied by statewide and regional members of the HBIF board. As of 2011, one out of five businesses in the Orlando area is Hispanic-owned and 29 percent of Orange County’s population is of Hispanic heritage. In recognition of this economic impact, the Board of County Commissioners allocated over $123,000 to the HBIF in 2014. Hispanic businesses in Orange County continue to expand and thrive helping to diversify Central Florida’s economy. Last year, Titán Products of Puerto Rico, a subsidiary of Empresas Barsan, established a new distribution center in Orange County, which serves Florida supermarkets with more than 200 products, including frozen foods, grains, and non-perishable goods. Additionally, the Polytechnic University of Puerto Rico held a groundbreaking ceremony for its extensive building expansion in May 2014. A collection of photos from the meeting are available on Flickr for use by the media.